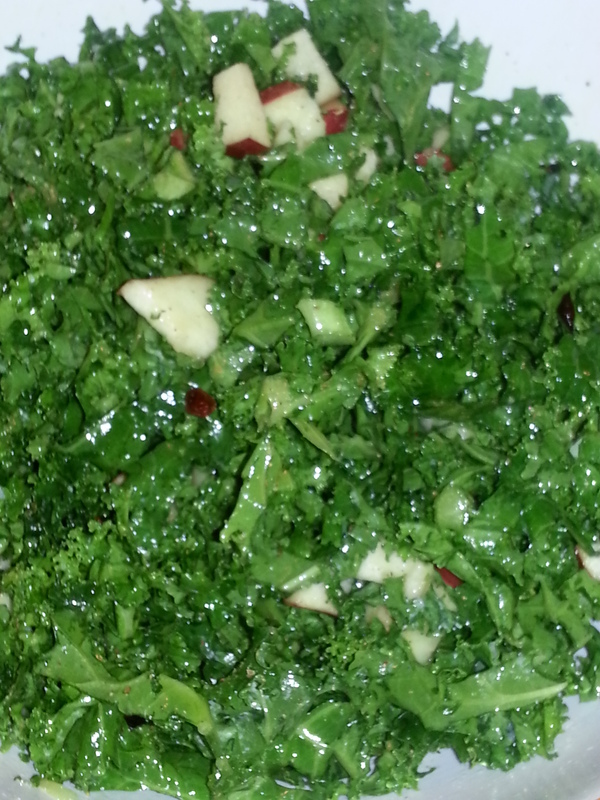 Kale Salad With Craisins and Apples! So the journey continues and in order for me to continue on this raw food challenge I had to come up with some raw food dishes to eat use. I am use to my kale salad having tahini in it or some other type of dressing. However, this challenge includes no processed foods. It turned out pretty good. So what I did was pull the kale into a bowl. I chopped up my apple and added the craisins. You do not have to use both. I then squeezed the lemon into the bowl and added my olive oil. I added about 3 tablespoons first however, I poured a little bit more until all of the kale had a shine to it. I added in salt (not too much) and pepper along with some garlic and herb salt free seasoning. It was quick and easy. It taste delicious. If it’s too tart, add a bit more apple, craisins or raisins. Season to your taste. I tend to not measure things at times unless I am baking. So there you have it, enjoy!